Request an Estimate Free estimates for your new system. Maintenance Plans Get peace of mind & priority service. No other single system in your home plays a larger role in your comfort or how much your utility bill will be than your heating and air conditioning system. 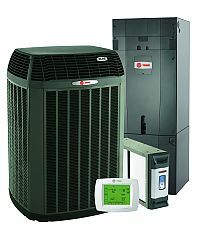 At Total Systems Heating & Cooling, Inc., our goal is to keep your system running efficiently year-round. We service ALL makes and models of equipment. Our highly-trained technicians are available to handle all your service needs from licensed warranty and post-warranty repairs, to immediate emergency response. We offer Maintenance Plans that can help extend the life of your system. We install ALL makes and models of equipment. In climates like ours, a high-efficiency HVAC system can keep your whole house comfortable while keeping utility costs low. We specialize in cost-effective high-efficiency solutions, including natural gas, oil and electric furnaces, boilers, and gas and electric heat pumps. We're experienced with design/build for foam & green homes. Call us at (910) 436-3450 to schedule service or request an estimate today! Total Systems Heating and Cooling, Inc, (910) 436-3450, service@totalsystemsnc.com | Base Content Copyright © 2019 Market Hardware, Inc.